JuiicyScoop: Queen Latifah: I've Enjoyed Being A Blonde!! 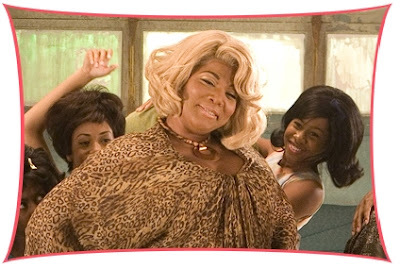 Those were the famous words quoted by Queen Latifah on her transition from the Queen to Motormouth Maybelle in the new big-screen version of "Hairspray". It's a month away from coming out, but word is that "Hairspray" will be a breakout hit much like the stage musical. 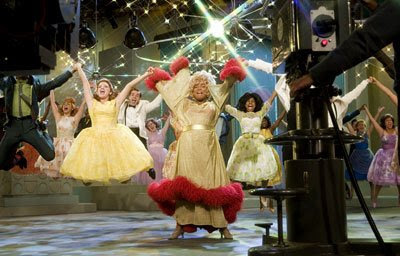 Sixteen years after the release of the original film, New Line Cinema is bringing a feature film adaptation of the Tony award-winning Broadway production "Hairspray" to life. Featuring new and original material based on John Waters' 1988 cult classic about star-struck teenagers on a local Baltimore dance show. Cast also includes Michelle Pfeiffer, Christopher Walken, Amanda Bynes, Allison Janney, Brittany Snow, and Zac Efron. Go Queen!!! Do your thang! She's beautiful!!! I can't wait to see this movie, I didn't know she was even in it! She looks like Magilla Gorilla in a blond wig.